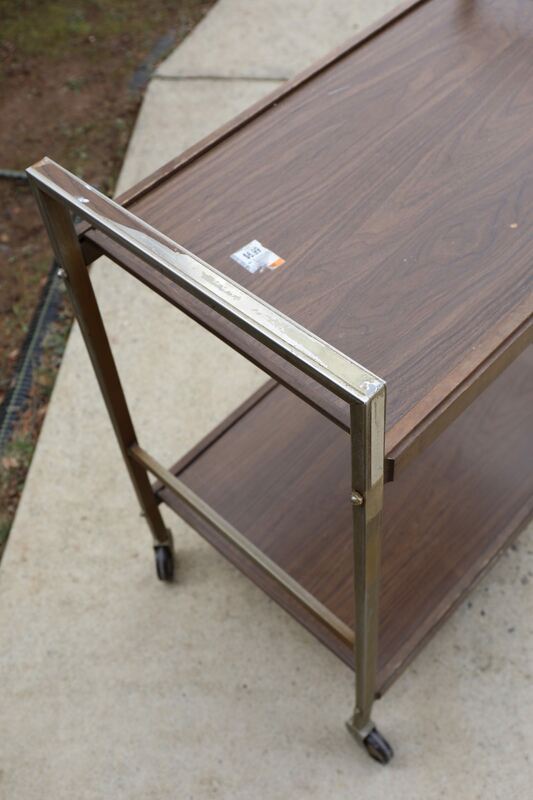 BEFORE & AFTER: Vintage Bar Cart Makeover From the Thrift Store! You are here: Home / DIY Tutorials / BEFORE and AFTER: Vintage Bar Cart Makeover From the Thrift Store! 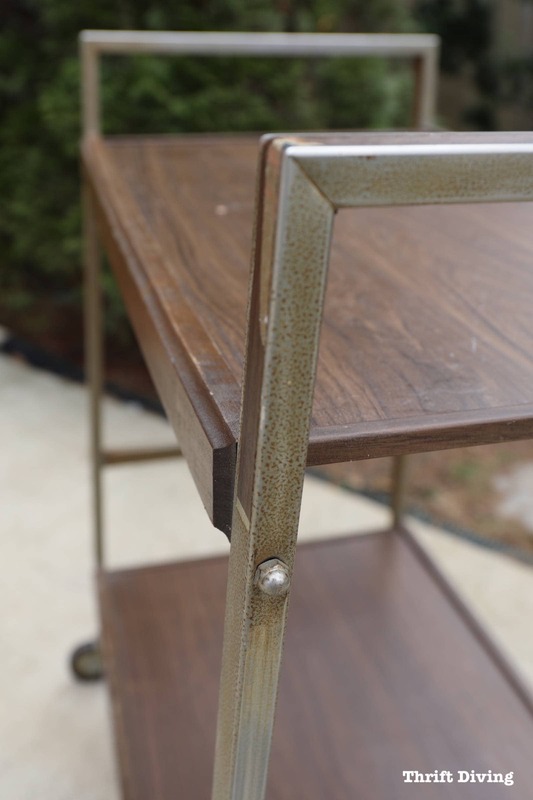 For the sake of ease, let’s just call this a vintage bar cart makeover from the thrift store. 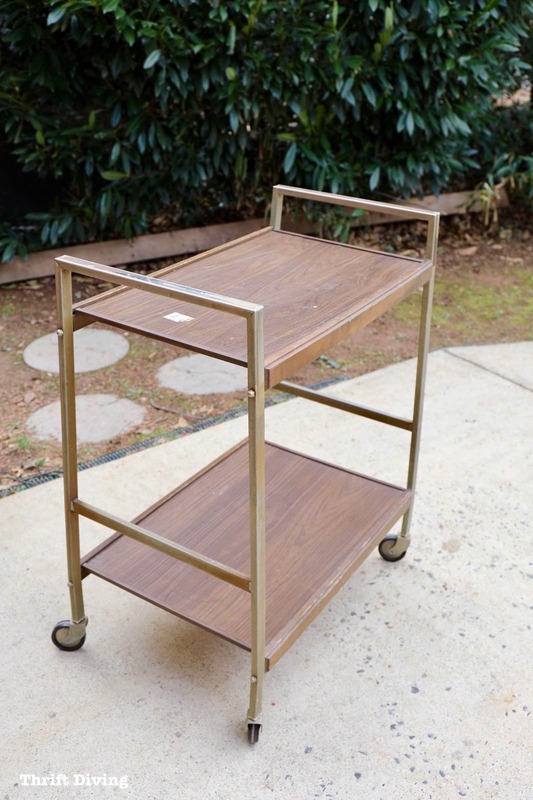 (Although I am definitely aware that this is an old TV cart from the 60’s and 70’s, I much prefer to think of it as a bar cart or, as I will use it, a tea cart!). But regardless what you call it, it’s a DIY project that made me dance around in my garage with glee because it turned out waaaaay better than expected! And what’s surprising is that I didn’t have a single blunder during this bar cart makeover. Not once did I throw down my tools in frustration, walk away in confusion, or yell a steady stream of obscenities out in my driveway. Ha! Maybe I’m just learning how to be more cautious before jumping into projects with two feet. Or simply taking my time. Whatever the reason, this bar cart makeover turned out right, and I couldn’t wait to tell you the story of how this makeover came together! Watch My Bar Cart Makeover Tutorial! Can we just marvel for a second that this rolling TV cart (which I’m now going to refer to as a “bar cart”) only cost $22 to make over? The cost would have been slightly higher if I had paid for a few of the materials, but that’s one of the perks of being a blogger–companies like to send us “free” stuff without having to pay bloggers for advertising. But that’s a whole ‘nutha topic…I will say it’s fun to try new products and when they work, I like to pass on the recommendation. So overall, I paid $22 out of pocket for the materials. Sweet! Total cost: About $22.00 out of pocket! This poor little cart sat in my garage for at least 3 years, like most furniture projects do, before I got my hands on it. At first glance, I knew I’d want to cover these shelves with some pretty paper because the condition of these old 1970’s shelves was bad. The legs were rusty and had old vinyl peel-and-stick strips on the legs. The shelves were also bowed. 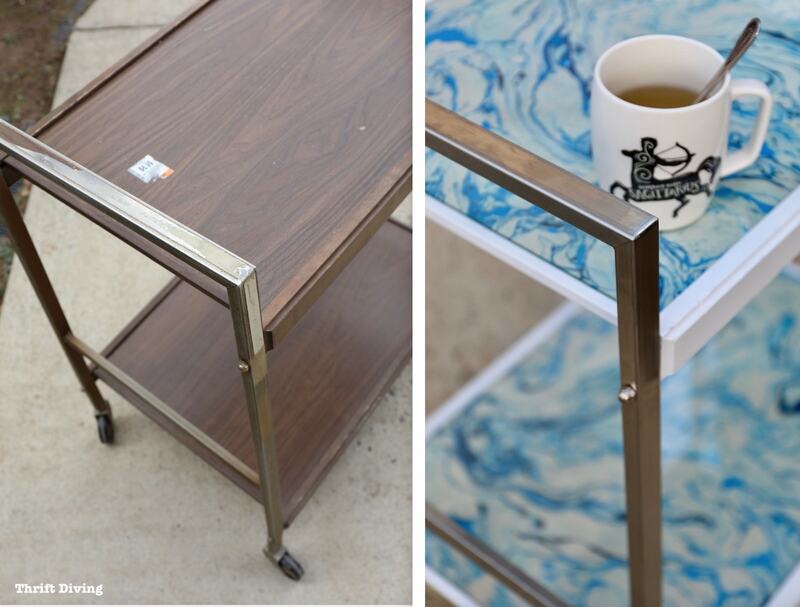 Who wants to sit coffee, tea, or glasses of wine on a cart that’s sinking in the middle? So this whole bar cart was going to have to be dismantled. (And yes, that sticker is correct: only $6.99! I probably had a coupon, though. LOL). I’d never used rust remover before, so I was really curious how this would work. The turn-off was that the rust remover would need to be wrapped up in plastic for a good 12-24 hours. SIGH….This wasn’t ideal when I just want to move, move, move on a project, you know? But sometimes you’ve got to be patient with DIY. It must be done in steps. You gotta follow the instructions and take your time for the best results. You could see the brown rust pooling on the surface of the metal! It didn’t require much elbow grease, thankfully. It just wiped off with hot water and a rag. While the metal of the bar cart wasn’t perfect, it was a huge improvement! 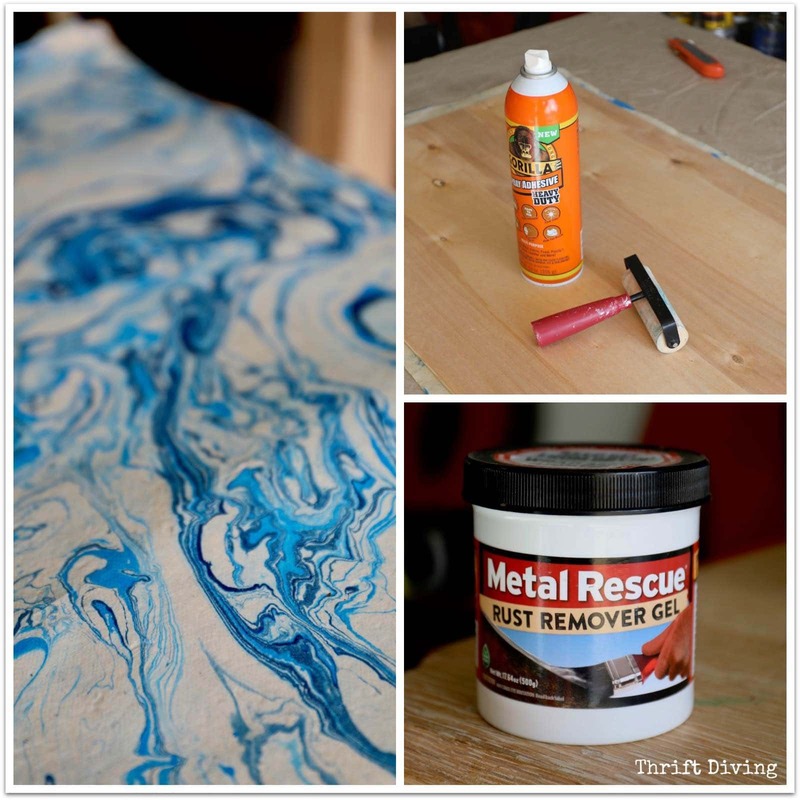 This rust remover gel worked so well that the rust simply slid off that metal like butter on a hot potato! After seeing how well they turned out after cleaning them, I knew they’d be great to leave natural. No spray paint needed. When the metal was dry, I used some Goo Gone to remove any sticky adhesive that the laminate stickers had left behind. 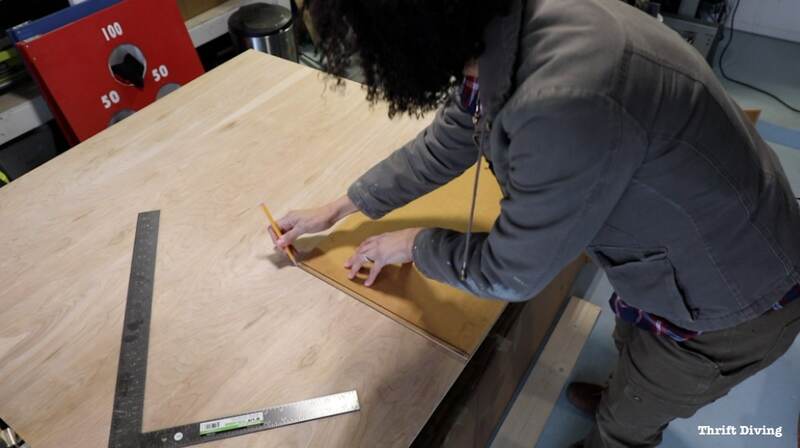 I followed with 0000 steel wool and even some super fine 800-grit sandpaper! I would have liked a bit more shine, but compared to what the original looked like, this was a big improvement! The bolts and metal rods holding the cart together also got de-rusted. Have you bought wood lately?? It’s expensive as heck for some types! The cheapest option for me was to buy this 1/4″ underlayment, which is typically used for under flooring. But it was large enough and thick enough to cut two pieces from it and still have enough left over for other projects. 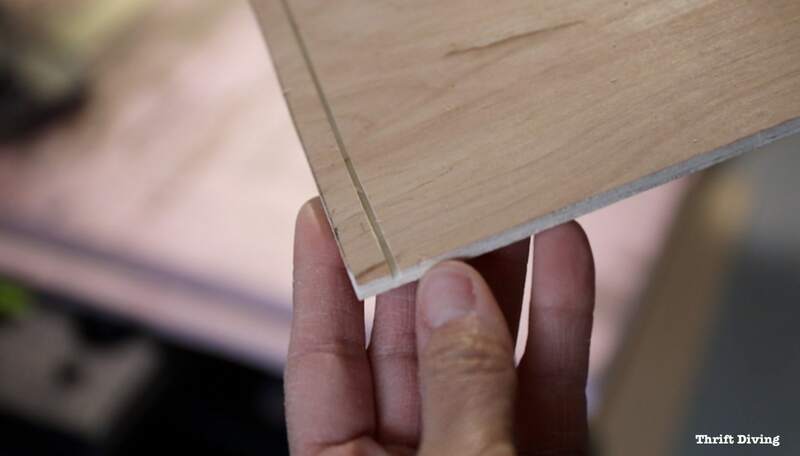 Here, you can see on the original shelves that there was a groove, a ditch, where the side piece slides on to the shelf. 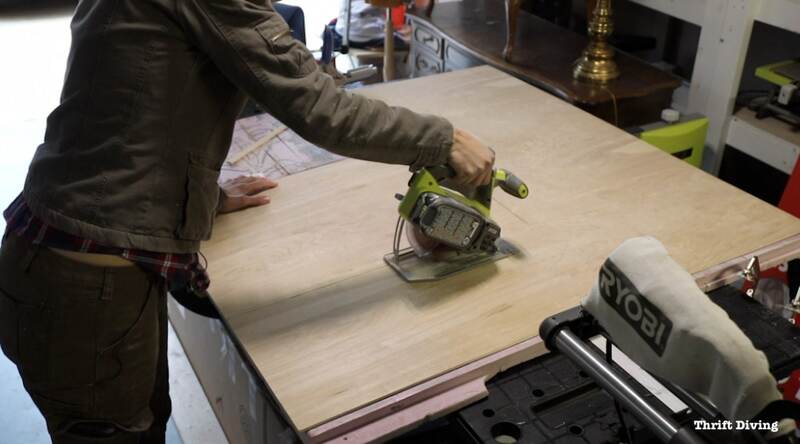 In order to re-create that for my new bar cart shelves, I had to set the depth of my circular saw really shallow to where it just barely grazed the wood. I could only hope I had done it properly so the end caps would fit on the new shelves. This is where I needed to make sure I took my time. 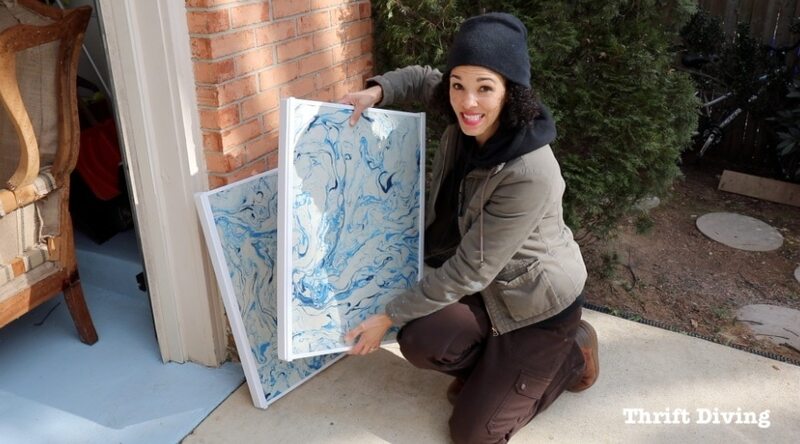 This marble paper at $8.00 a sheet, while it isn’t too expensive, wasn’t that cheap that I wanted to ruin it due to stupid errors, like applying it crooked or ripping it. I bought the paper from Paper Source, which almost makes me drool whenever I go there and see what goodies they’ve got in stock! They’re handmade and are usually in limited supply, so I’ve learned that when you find a print you like, you must buy as much as you can afford. They usually don’t re-stock the same styles. Related: See my UGLY lamp makeover using pretty paper on the lampshade. 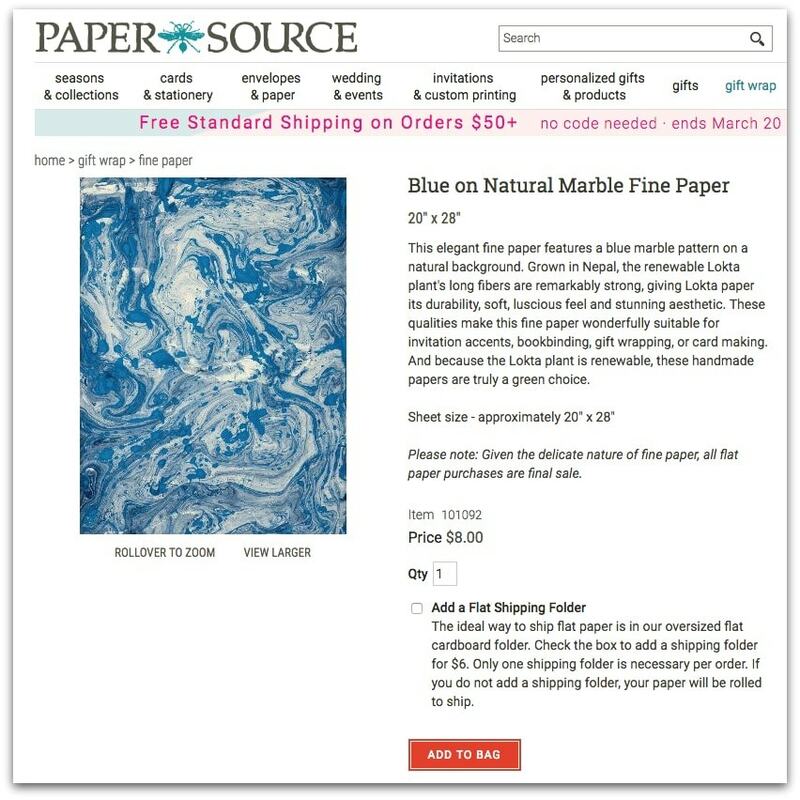 Here is where you can buy the marbled fine paper from Paper Source, using my affiliate link. 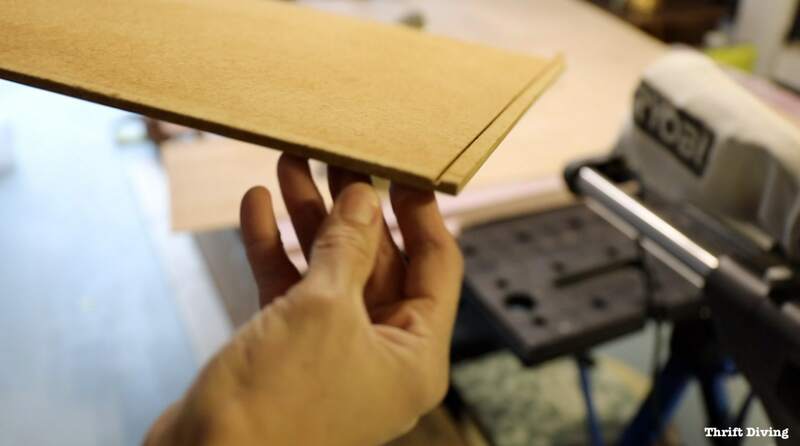 I used the spray adhesive on both the paper and the wood shelf, letting it sit for 1 minute before adhering them together. 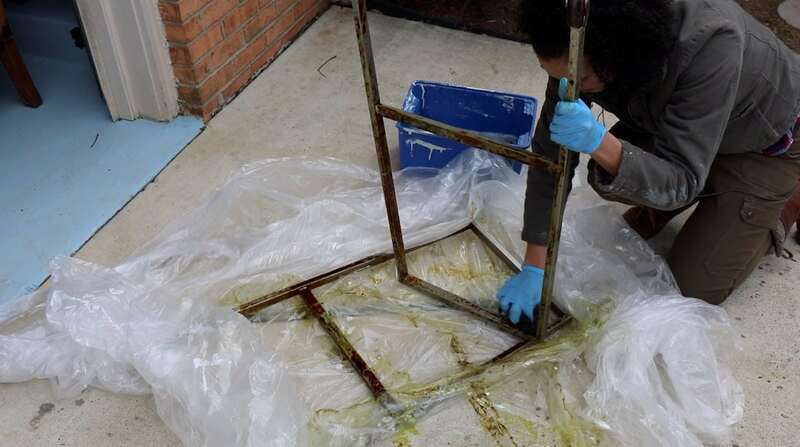 The brayer, which is a hand tool with a roller on it, helped to remove any bubbles left behind. It was a nice, secure bond between the paper and the shelves. Because of the metal and wood pieces that capped the edges of the shelves, I had to do a few things to get those to fit. You can watch the video tutorial on my YouTube channel to see the details. But overall, it turned out great! I decided to go with a white semi-gloss for the wooden sides of the bar cart shelves. 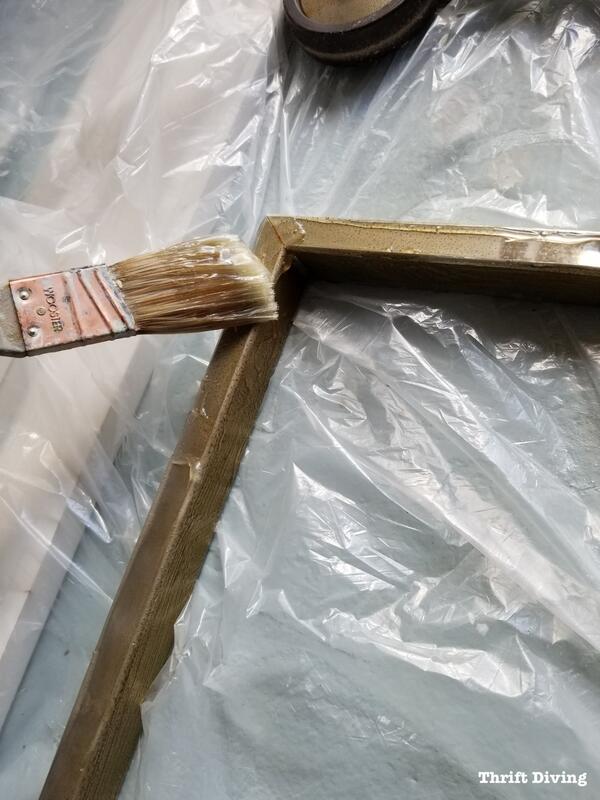 But at first, I wasn’t sure what color would look best, so I did some tests, which I explained in the bar cart makeover video, as well. I’d always recommend testing things out when you’re not sure what colors/styles look best together. Buy extra materials so you’ll be able to do those tests! Getting the cart back together was pretty simple. 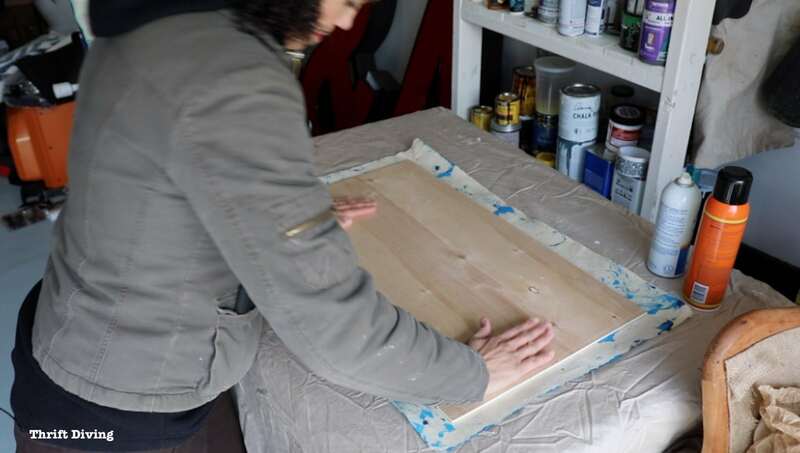 I just had to be careful I didn’t drop or scrap the fresh paint or to tear the new paper-lined wood shelves! I stopped by my local Ace Hardware to get some glass cut (I don’t believe that Home Depot or Lowe’s cut glass). Surprisingly, it was only $20 total for the two pieces of glass! The glass added that extra “umphf!” I was looking to achieve, stepping it up and making it look more swanky and shiny. 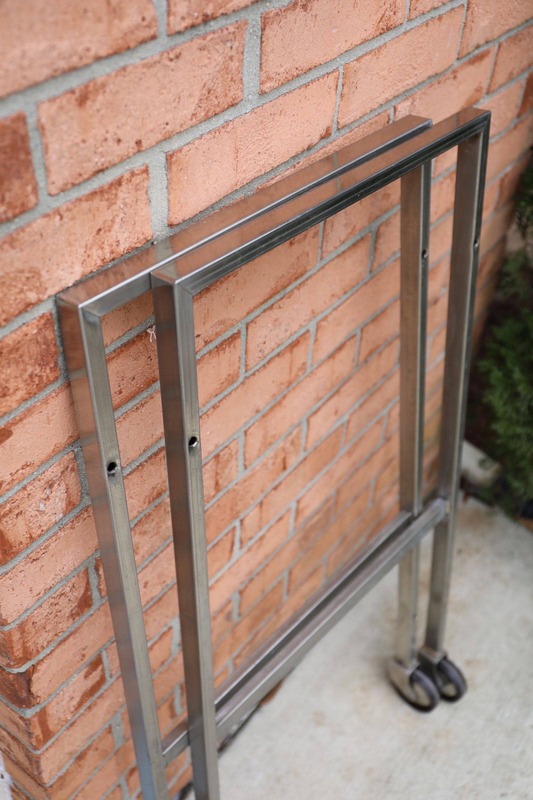 Some people have criticized that this glass I used is window-pane glass and isn’t strong enough to withstand any kind of wear and tear and that if it breaks, it can be dangerous. I would agree with them–it’s definitely not ideal. 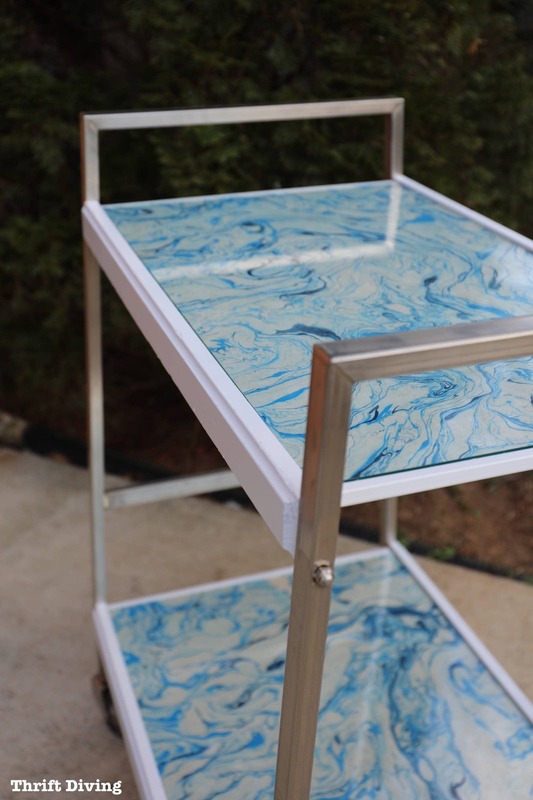 Tempered glass is what’s typically used for glass table tops, glass shelves, etc. But I did a quote online for custom tempered glass and–OMG–it was $238 total for two pieces of tempered glass 1/4″ thick in these dimensions! That’s just not realistic for a $6.99 bar cart! So, I’ll take into consideration that this glass could potentially be dangerous if the cart should tip over, or if something is slammed down onto it. I’ll keep those things in mind. Who knows, maybe I’ll decide to try to epoxy over it to achieve the same glassy finish. We shall see! 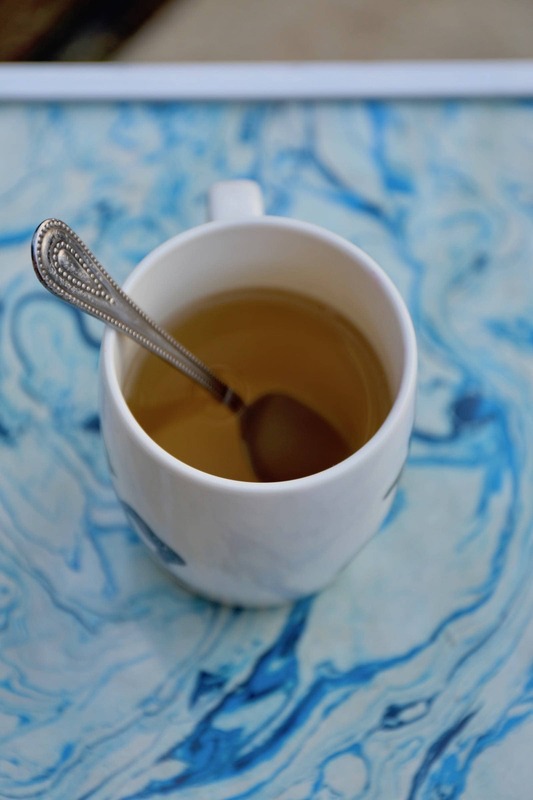 But for now…. 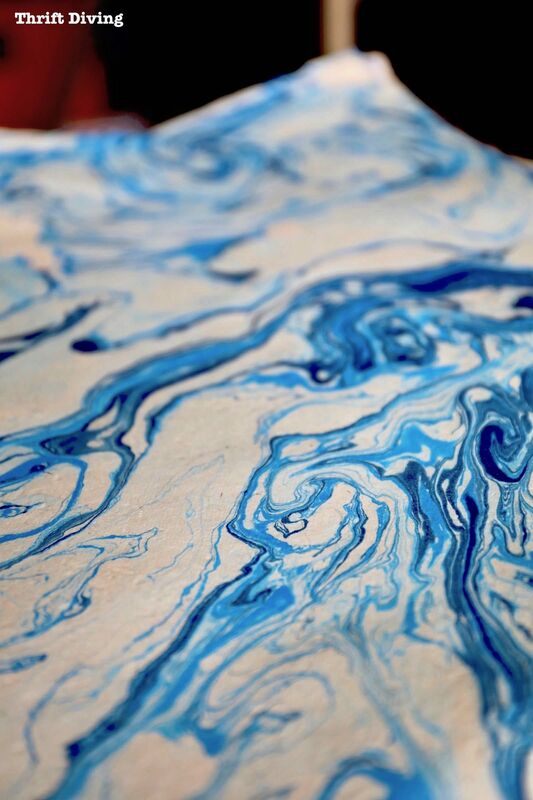 I just can’t get over this marbled paper…it’s GOR-GEOUS! I feel like I could get lost in it, don’t you? It’s that good. You’re probably wondering where I’m going to put this bar cart. When I look at the metal, I’m glad that I removed the rust and simply restored it. 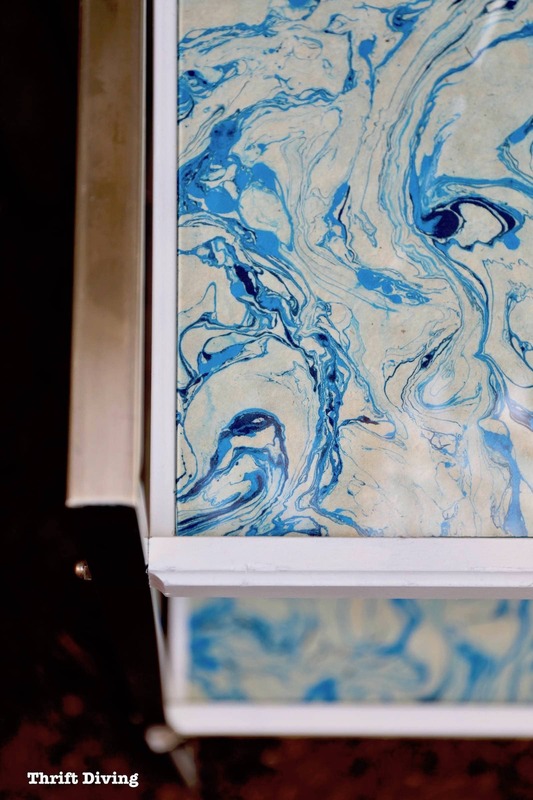 To have spray painted over the metal would have taken something away from the beauty of this vintage bar cart (or rather, TV stand, since most people probably used this as a TV stand back in the 70’s!). 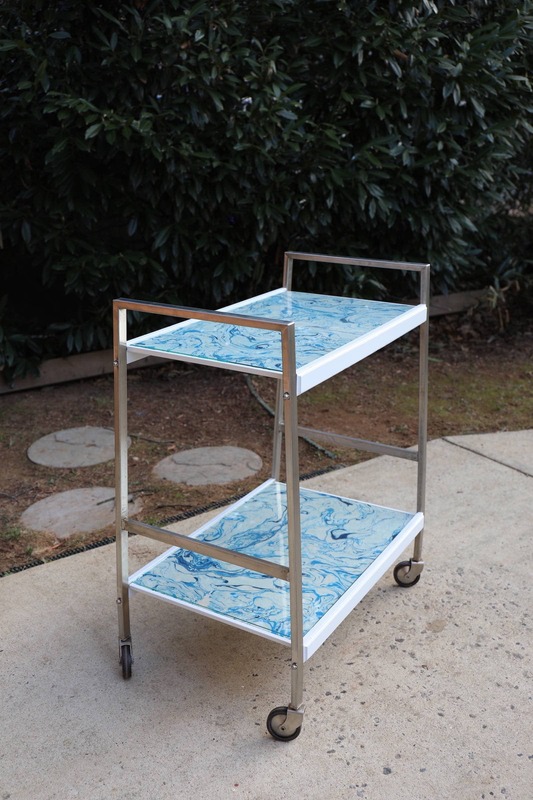 And if you’ve enjoyed this bar cart makeover, check out my other projects where I’ve used paper creatively! An Ugly Lamp From the Thrift Store Gets a Makeover! 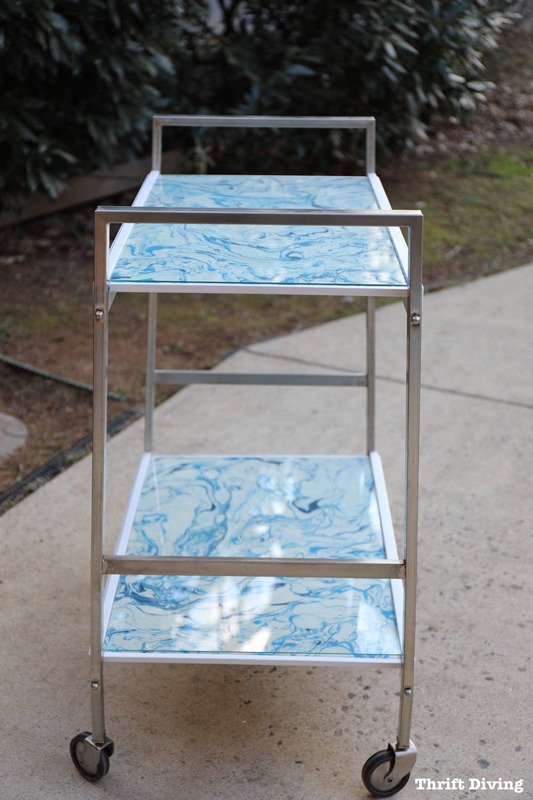 Do you love this bar cart makeover? 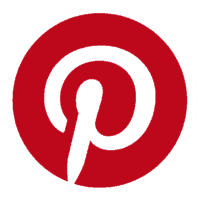 Click here to SAVE it on Pinterest! So what do you think?! 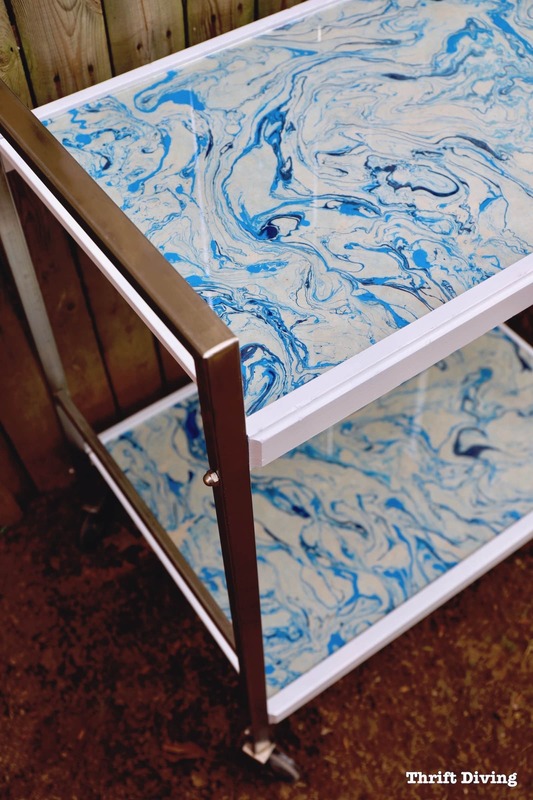 Do you love this TV cart / bar cart makeover and marbled paper as much as I do?! Leave a comment and let’s chat about it! « I’ve Got a New Beacon of Spring! This is beautiful! I’ve been looking for a bar cart and hopefully I’ll find one soon. This has given me a lot of inspiration! Hey there, Linda! I haven’t decided yet! I was actually thinking of doing another video and testing all the options: epoxy, sealers, and more! I’ll keep you posted what I decide to do! What a gorgeous makeover, Serena. I really like the way that marbled paper turned out. What a great idea. I love Paper Source, and never miss a chance for a visit when I got to Santana Row nearby. That rust removing gel worked like a charm! It’s all as amazing as you are. Hey, Alys! Awww, thank you for such sweet comments! I’m glad you like it. It was an exciting project to do. It’s just reached 102,000 views on YouTube, which is insane! I’m so glad people like it! In all honesty, I had my doubts about this cart. However….. you did an excellent job giving this sad little cart a new lease on life! I also have concerns on the leaking down and ruining the pretty paper. Suggestions? Nada…sorry. Unless, like on my dining room table which has glass on top of the wood, I have those little clear round disks so I can get under the glass before it soaks into the paper. Other than that, I would be interested if some idea pops up from your faithful followers, that solves this dilemma. I’d definitely put something on the paper under the glass to preserve it. Any spills could run down the glass and pool under it, ruining the paper. This was a lovely project. The paper was so pretty. I would never feel comfortable using the circular saw like you did, though. Kudos on a nice step-by-step description of what you did. I adore the swanky cart! It really caught my eye, that paper is amazing I thought this piece was painted and epoxied, you fooled me! A great retro rehab that is just so on point….. great job really love this piece!